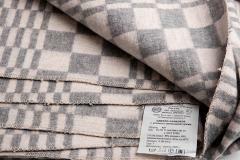 A cotton flannel blanket, genuine Russian manufacture! For a reasonable price you'll get a quality piece of fabric with a depressing colour scheme and a pseudo-cheerful decorative pattern. If wrapping yourself in this blanket doesn't make you feel socialist enough, you can also try to pay extra taxes. If it's easy enough, you'll get rid of excess money, and if transactions with the taxman are difficult, it will only improve the experience! Official measurements 2,12 x 1,4 m, weight 1,7 kg. Made of 80% cotton, 20% Something Else. The decorative patterns vary a bit, but all are the same colour. In excellent condition. At a glance all looked unused, but can't guarantee this. Kai se on vähän arpapeliä näiden ylijäämien kanssa, mutta omassa tuotteessa oli joku ryssä jyrsinyt kulmat auki ja keskellä huopaa iso keltainen tahra, joka ei pesukoneessakaan lähtenyt. Huopa on muutenkin melko kankea ja tuntuu vähän samalta kuin kääriytyisi lattiamattoon. Ei nyt ihan täysin vastannut tuotekuvausta, mutta annetaan kuitenkin 3/5 koska eihän tuo ole hinnalla pilattu ja ei kai sitä parempaa voi odottaakaan käytetyltä venäläiseltä huovalta. Varmasti silti ihan toimiva ratkaisu. Hintaan nähden tosi hyvä huopa, pitää sadettakin mitä tuollaisen huovan voi odottaa pitävän. Mitään rankkasadetta ei ole tullut testattua, mutta kevyttä sadetta pitää kyllä. Omassani ei ollut mitään sotilaiden jyrsimiä reikiä tai eritetahroja, ainoa laatuvika, että kahden kulman ompeleet aukes ja kulmat vähän hajos ekassa pesussa, mutta ei mitään mitä ei voisi korjata pienellä ompelulla. I WOULD Recommend to a friend or anyone!!!! I pushed the wrong button! 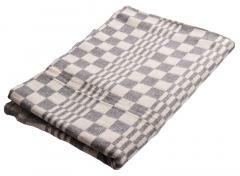 Great military blanket at a good price. Mine came practically new. 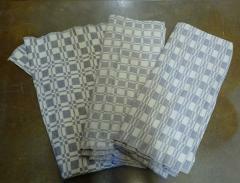 These are light, warm, and breath well, just as you would expect from this type of blanket. One is now on my bed, and one will go with me camping/packing. I have no idea why anyone would not give this 5 stars, it is perfectly described, well made and looks neat! I would absolutely recommend these to anyone - They're warm, they're soft, they fold up small for travelling with, they're nearly as tough as a wool blanket, and they look amazing. I've got three so far, all different patterns (and all different to the patterns shown too!) and somehow the cozy grey colour scheme makes them feel even warmer and softer. A friend thought that they were some sort of mid-century modernist design classic that I'd had to pay a fortune for, they look so fantastically on-trend. Pair with warm lighting, bright blocks of colour and dark timber for a retro-futurist approach, or with mud and a primus stove for a more traditional look.